Shopping on Instagram has finally arrived! Instagram has been testing the feature since 2016, so you may have seen this feature on your feed before. But now the integration is officially going global and will now be available in 9 countries. Why should I sell on Instagram? More than 800,000 shoppers now use Instagram every month, and brands around the world are using the platform to share their stories and products in a visually engaging way. Engagement rates on Instagram are 15 times higher than Facebook and 20 higher than Twitter! So let’s get going! 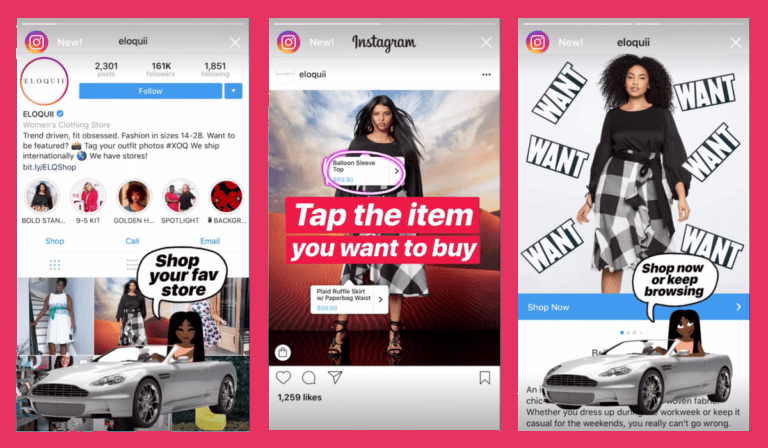 Instagram shopping works so that when your followers tap the product details tag, a new page opens within the app where they can see more information and imagery of the product. If they tap the ‘Shop Now’ button, it will take them directly your Teespring link for the corresponding product where they can add the item to their shopping cart, ready to check out. 1. Ensure Your Instagram Profile is a Business Account. You can do this in your settings. Just tap ‘switch to business profile‘ and select the Facebook page you’d like to associate your business with! (Tip: Private Accounts can’t switch to Business Accounts). You must have at least NINE products in your facebook catalogue for Instagram shopping to be enabled. Creating a catlogue is simple: On your Facebook Business Profile go to your ‘shop’ and add your products, by uploading imagery alongside your links and pricing. The approval process from Instagram can take anywhere between a few hours and a few days. Once you do receive the approval, you should see a notification in your Instagram Business Profile. Remember, Instagram is a visual platform with over 800 million monthly active users. Visual content is extremely important, especially when selling apparel and studies show that visual appeal matters in 93% of cases when people go to make a purchase. Check out this blog post from Instagram themselves on how to create fantastic content. Be sure to tag your products in your photos. You can tag your products in the same way that you tag people when you upload a post. It’s as simple as that! Good luck! Be sure to use the hashtag #TeespringFeatured for a chance to be featured on our social media channels! You don’t explain how to submit it to instagram. That should be your step 3. Are we talking an add here or what? The process is automatic, so there is no need to submit to instagram. Hope this helps! I did everything correct, got the catalog in business profile, and even connected a FB pixel between Teespring and FB Business Manager. I feel like Instagram is only approving big companies and not paying any attention people who want to sell t-shirts. Ours is a small business and we just got approved after 3 weeks. Figured out we had made a simple mistake by having our url as http instead of https on our Instagram business account. Double check all your settings, make sure your Business Manager is the page owner and is connected to your Ads Manager account and doesn’t just have access and also check that your product catalog shows on Business Manager as well as the shop section of the page. As a last resort you can also post in the help forum. I received a message shortly after posting saying a consultant will get in touch and they phoned me the next day. Within 24 hours the Instagram shop was up and running. Do you have a link to the Help Forum you mentioned? Thanks. Where did you get the info that you need 9 products to be eligible for it to be enabled? I think that’s our current hangup, but we should have 9 products shortly so not too worried about it. When you provide your,storefront url are others able to see your profile information? Hey Robin, providing your storefront URL will just give other users a link to your Teespring storefront. All of your profile information is confidential!